I am having forty kinds of fits with this "computer" and need help. The machine is a Dell Inspiron 3452 with a 32GB drive mounted on the motherboard. It's one of those that cannot be upgraded. The 2GB SODIMM RAM can be removed and upgraded to 4GB, but that's it. Windows 10 takes up 1/2 of the hard drive and the first automatic update (thanks to MS) took up the other half before it even finished, filled the drive to capacity, and rendered it unusable. The owner turned the machine on, connected to the internet, and now cannot even load a single program. ...and each with 100% free space. I'd like to use the tools in Disk Management to reallocate drive space on that largest "recovery" partition, but they don't exist on this machine. Tried to install Easeus Partition Master and there's not enough room for a 36MB file. Either it just doesn't give me the option to run it from a USB drive or I don't know how. I'm so frustrated, I don't even know the right questions to ask. I guess the one to get started is how do I get such a limited machine to run a program directly off a USB drive? To be specific, many tutorials tell you to simply open Disk Management and right click on the partition you want to work with. When you do that, ordinarily you have 9-10 options, including Help. This machine gives you only one: Help. When you click Help, it tries to open up online and I cannot afford to let this machine connect to the internet due to auto-updates. I have the network adapters temporarily disabled. Available free space on this machine is 0. I also forgot to thank you in advance for any help you can give. I always do that and I guess there's a first time for everything because I forgot. Then you can reclaim the space used by the recovery image (delete the partition with the disc manager and enlarge the C: partition). It's going to require constant vigilance to run Windows in 32 G -- that's just not enough disc space for any modern OS. Thank you for stepping up to help, ein63. It's really appreciated. "We can't create the recovery drive. A problem occurred while creating the recovery drive. If I untick the box, it proceeds and creates a 314 MB recovery drive, but without system files. So I have one of those, but I suspect it's useless. For the next part of your directions, the Disk Manager doesn't give me any tools to work with on this machine. Right clicking any recovery partition only gives one choice: Help. On the C: drive and also on the (NTFS file system Lexor 32 GB) USB drive, I have 10 options -- even if some are greyed out. 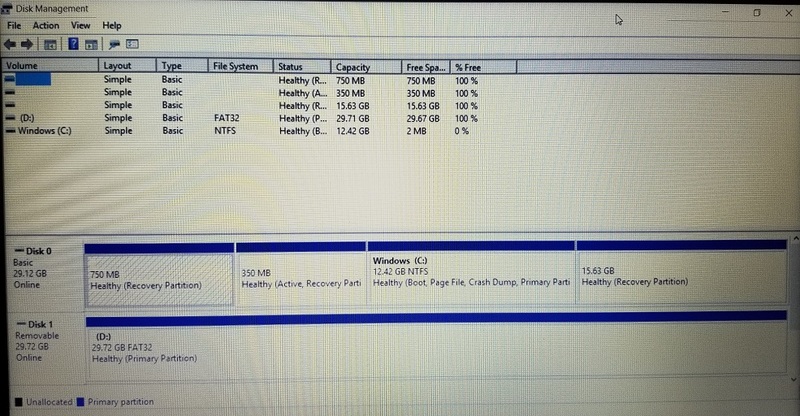 So, how do I delete the large recovery partition if the only option for that drive is Help? I hope that's enough extra information to answer any questions you might have in order to go forward from here. P.S. Trying to reset this machine to factory condition didn't work. It said "Preparing" for 15 hours and then said there was a problem resetting the computer and no changes had been made. I forget which # of fit that one was. Try making an image of the system using something like Macrium Reflect (the free edition is fine). The main question in my initial post was how do I run a program off a USB drive. The two programs I wanted to run were Macrium Reflect and Revo Uninstaller. Later, I wanted to use Easeus Partition Master when working a different approach. Bact to MR in specific: I tried to download and install Macrium Reflect as my first move on this computer, planning to save a mirror image before I did anything at all to it. It wouldn't download MR, saying there was not enough room. (Properties shows MR ver 7.1.2646 to be a 3.58MB file and it wouldn't fit?) So, on another computer, I downloaded the program to a USB drive which was formatted in advance and set up with NTFS to match the PC, then tried to run it on the 3452 laptop. It wouldn't. I just went through my notes, trying to find where I'd written down what the machine reported as to why it wouldn't/couldn't run MR, but can't seem to find them. Would it help if I wrote out a list of what I've already tried? It would be much helpful if you can provide some screenshots of your disk management. But if you want to shrink the partition, you can give aomei partition assistant a try. Please download and install partition assistant to a spare computer, then copy the whole installation files to your USB drive. Connecting the USB drive to this computer and try to shrink partitions. You'd better make a copy of the disk. Hi, annain ~ Thanks for coming along to help. I searched Easeus vs Aomei before getting back to you and it seems they're fairly comparable. Since I've used Easeus for years, that's probably the one I'll stick with. I just can't get this machine to accept any downloads to the main drive; the largest block of free space isn't free due to it being allotted to recovery; the built-in partition features don't work; and I don't know how to run a program from a USB or SD card. It might be the easiest thing in the world, but I'm unfamiliar and the things I've tried haven't worked...so far. There are three "recovery" partitions and I just don't think the one containing15.63GB is actually needed for recovery. I agree with the need to make a copy of the disk. However, here too the built-in tools don't work and there isn't room to download Macrium Reflect, which I usually use to make copies of drives. I'll try to figure out how to post a screenshot of the disk management screen, although it will be one taken by my phone, so I apologize in advance for how it will look. The D: drive is an SD card I got to increase storage. I'm hoping I can install and run software there that will let me 1) make mirror images of the drive, 2) reallocate space in the partitions, 3) and run REVO uninstaller.